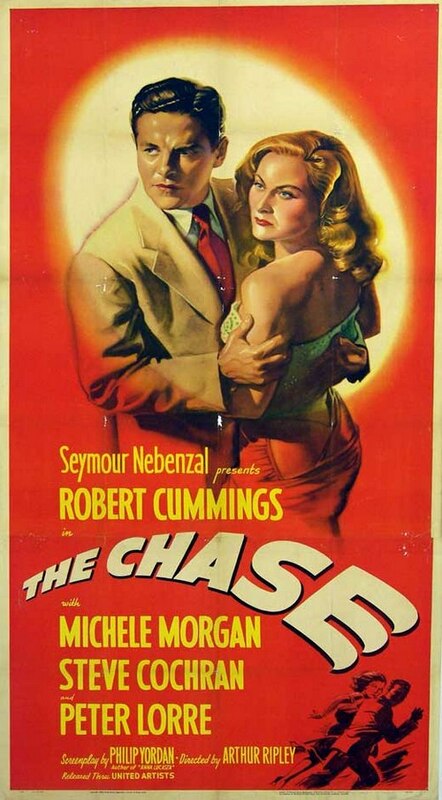 Tonight’s feature is THE CHASE  starring Robert Cummings, Michele Morgan, Steve Cochran and Peter Lore. Grace had been married to Francisco Mariani for four months before L.A. County Sheriff’s detectives told her that he was soliciting a hitman to kill her. Her first reaction was to file for a divorce—she should have gone through with it. I’d say that hiring a hitman to kill you rates orders of magnitude higher than the customary grounds for divorce such as infidelity and mental cruelty. But inexplicably Grace had a change of heart and resolutely stuck by her man. Grace’s friends thought she was mad. The evidence against Francisco was compelling. They advised her to cut herself loose from the “dapper Puerto Rican” as he’d been described in the newspapers. At Francisco’s preliminary hearing Grace testified that on the morning of March 25th she’d handed him $100 check made out to cash. He said he needed the money to pay the taxes on his secondhand furniture store at 2198 Fair Oaks Avenue in Altadena. He pocketed the check gave his wife a “farewell kiss” and left. Several hours later he was arrested in a Gardena gambling joint for masterminding the murder plot. Here at Deranged L.A. Crimes we know the value of keeping your own counsel. Taking another person into your confidence when you’re planning homicide is a mistake which often leads directly to the green room at San Quentin. Don’t pass GO. Forfeit the insurance money, property and your freedom. It’s a sucker’s game—but greedy people are short-sighted and they rarely see past their own desires. According to Mariani’s friend, Francisco Rodriguez, on an auto trip to Stockton in mid-March Mariani told him he wanted to do away with Grace. In an act of love and trust, Grace had signed her property into joint tenancy with her new husband. Isn’t that what married couples do? As soon as the paperwork had been notarized the plot against her gained traction. It may have seemed to Marriani that having friends in low places, like Rodriguez, was going to come in handy. Rodriguez said he knew of an ex-con who might do the job—then stalled Mariani by telling him the guy was in Chicago. Rodriguez promised to see the assassin on Monday, March 23rd and arrange a meeting—but instead he high-tailed it over to the Pasadena Police Department and ratted out his future former friend. Pasadena cops weren’t prepared to undertake the investigation so they referred Rodriguez to the Sheriff’s Department. That’s how Sgt. Clarence Serrano ended up playing the part of a killer-for-hire. Grace wasn’t the only person to testify at Mariani’s preliminary hearing—Sgt. Serrano also took the stand. Serrano described Mariani as “cool customer”. They’d met three times: the first time was at Rodriguez’s apartment on East Holly Street in Pasadena; then later that same day they met for a second time at Mariani’s home. While Grace was out shopping her husband gave Sgt. Serrano a tour of the home. The third meeting was held the next morning at a downtown Pasadena street corner and final arrangements were made while the two men drove around the city in Mariani’s car and discussed how and when Grace would die. Serrano asked Mariani when he wanted the job done and was told “Today would be fine. In fact, 12:30 this noon would be a good time. My wife will be alone”. Mariani then handed Serrano one of his old ties to be used as garotte to strangle Grace. Ostensibly the motive for the crime would be robbery. Mariani gave the false hitman instructions to ransack the house to make it look convincing but admonished: “When you’re ransacking the house, don’t muss up my shirts.” The sight of his wife’s purple and bloated face in death would not be too much for the grieving widower to bear, but wrinkled shirts, that was another matter entirely. 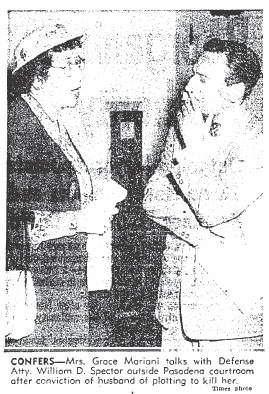 As proof that “the job” was done Serrano was to bring Grace’s diamond ring to the Gardena poker parlor where Mariani would be establishing an alibi for the time of the murder. When Serrano arrived at the Gardena gambling den he walked up to Mariani, who turned away from his card game for a moment, and asked: “Did you get the job done?” The deputy/hitman said “Yeah, man!” Mariani asked: “Did she scream?” Serrano replied: “No—but I had a little trouble. Hurry up and give me the money.” “Let me see the ring” Mariani demanded. That was when the other Sheriff’s detectives appeared and took Mariani to jail. The D.A. was confident that he had enough evidence to take Mariani to trial. He couldn’t wait to get Sgt. Serrano on the stand to describe the conversations he’d had with Mariani about the murder. Even better Mariani had been recorded describing the plot in great detail to the would-be killer. Mariani was held to answer for the plot against Grace, but he lucked out on the suspected poisoning of his sister-in-law. 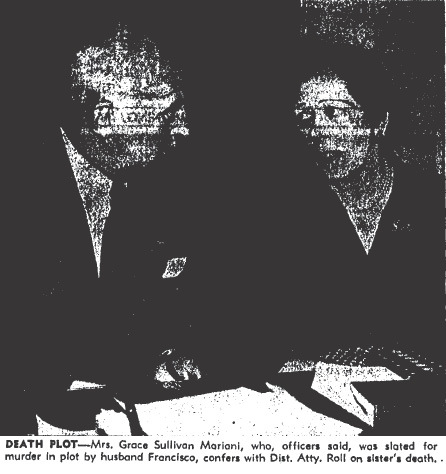 Grace had signed-off on the exhumation of her sister, Emeline Sullivan. The Frederick Newbarr, the coroner, had autopsied the body and found no evidence of strychnine. That was the only good news Mariani would get. At his trial Mariani entered dual pleas of not guilty and not guilty by reason of insanity. He professed his undying love for Grace: “I’m still in love with my wife. I hope that this trial will bring out the true facts of the case, and that we can go back together again when it is over.” It remained to be seen if the jury of eleven women and one man would buy his story. Even as the case against her husband grew stronger Grace told reporters: “I definitely feel he is innocent of trying to have me killed. I still love him.” Grace was finally permitted to visit her homicidal spouse. It was an emotional reunion—the two fell into each others arms and sobbed. Nothing she heard seemed to matter to Grace—she was a woman in love, or at least a woman with serious delusions. She flatly refused to testify against Francisco. Mariani at first denied that it was his voice on the wire recording—he insisted that someone was playing a very unfunny prank. He later admitted that the voice was his but claimed entrapment. That line of defense went nowhere so he backtracked and claimed that he had been forced by his former pal, Francisco Rodriguez, to plot Grace’s murder. He said he’d been duped into becoming involved in the plot. The alleged motive for Rodriguez to pressure Mariani into murder was that he wanted the two of them to open a gambling casino in Puerto Rico. Grace was unshaken by the testimony or the recording and reaffirmed her commitment to stand by her husband: “I am in this situation because I believe that I love my husband, yes; but also I am involved out of a sense of duty as a wife.” Her resolve may have been weakening. Maybe her friends were finally getting through to her. She told reporters that the fact that she was standing by her spouse didn’t mean that they would automatically reconcile following the trial: We will have to talk that over between ourselves. We will have to find some common ground on which to build a new life together.” A murder plot doesn’t sound like a very sturdy foundation on which to build a marriage—but maybe that’s just me. I’ve got to hand it to Grace, she took her marriage vows seriously. She even said that she would devote her life to her husband’s mental recovery. Apparently she ascribed the murder plot to his mental state rather than his avarice. In the end it didn’t matter what Grace did because the jury found Mariani guilty of soliciting murder. 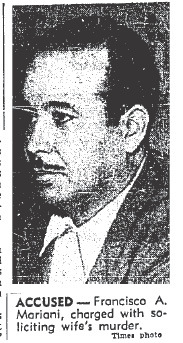 Pasadena Superior Judge Benjamin J. Scheinman sentenced the “dapper Puerto Rican” to from one to five years in prison. Mariani wept as the verdict was read, wiping his eyes with a monogrammed handkerchief (a gift from Grace). Francisco Mariani was hustled off to the state pen where, if he behaved himself, he likely got out after three years—but that’s merely speculation. I couldn’t locate any information on him subsequent to his imprisonment. Did Grace wait for him? I couldn’t find out, but I sincerely hope not. 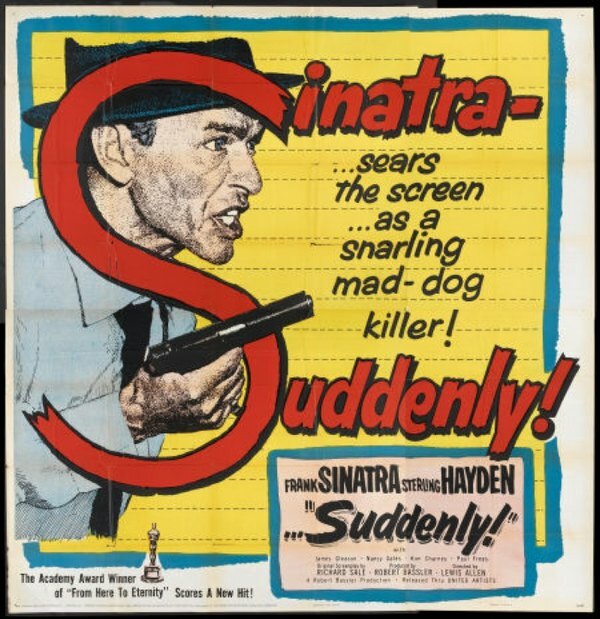 Tonight’s feature is SUDDENLY! 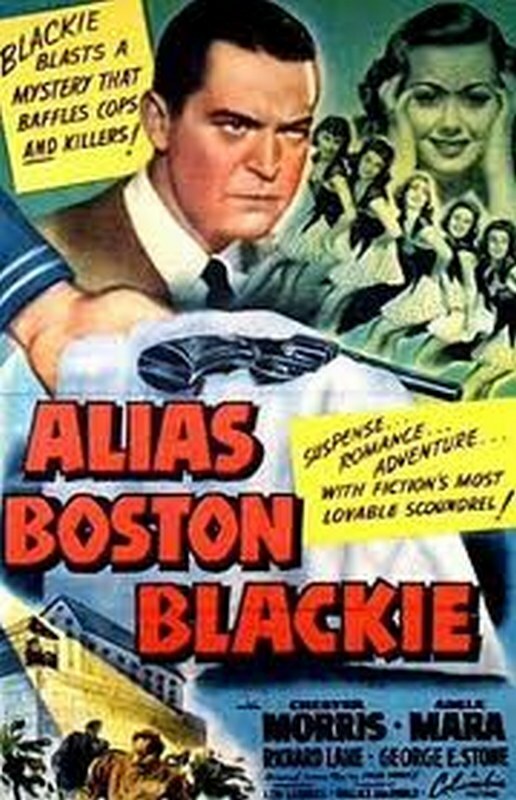 starring Frank Sinatra and Sterling Hayden. The tranquility of a small town is jarred when the U.S. President is scheduled to pass through and a hired assassin takes over the Benson home as a perfect location to ambush the president! Tod Shaw, the sheriff of the small California town of Suddenly, is courting Ellen Benson, a widow whose husband was killed in the Korean War. Ellen and her eight-year-old son Pidge live with her father-in-law, Pop Benson, a retired Secret Service agent. Ellen, who has become embittered by her husband’s death in battle, is overprotective of Pidge and will not allow him to see war movies or own toy guns.One Saturday morning, Ellen is dismayed to discover that Tod has bought her son a toy cap pistol, prompting her to break up with him. Later, Tod learns that a special train carrying the U.S. President will be arriving at the town’s railroad station late that afternoon. The president will de-train, then travel by car to a nearby ranch for a fishing vacation. Tod is instructed to coordinate the local security procedures and, after requesting assistance from the state police, meets with members of the advance secret service team, led by agent Dan Carney. Carney assigns his men to inspect and secure all the buildings overlooking the station, including the Benson house. 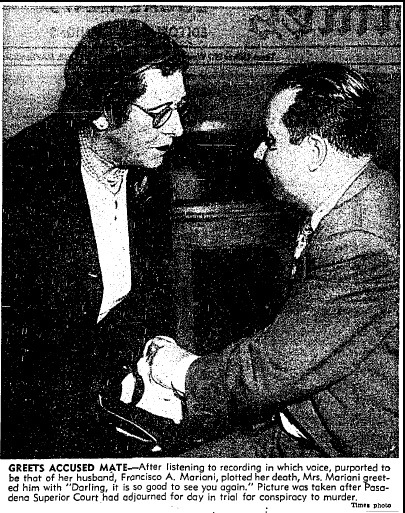 In late March, 1953 the Sheriff’s Department received a tip from a man named Francisco Rodriguez. Rodriguez claimed that his friend, retired Pasadena antique store owner Francisco Mariani, had asked for his help in finding an ex-con who would be willing to commit a murder. Mariani wanted to be rid of Grace, his wife of only four months. Rodriquez didn’t want any part of a murder so, without saying a word to his pal, he ran right to the Sheriff’s Department and spilled the whole story. Rodgriuez seemed credible to the deputies, but they needed to investigate further before any arrest could be made. Lt. D.H. English assigned Sgt. Clarence Serrano to go undercover as an ex-con without a conscience who was willing to do anything to get his hands on some cash. 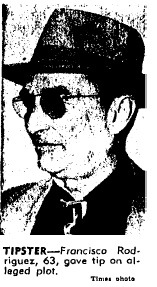 Rodriguez introduced Mariani to the false hitman. Serrano said he’d take the job but he objected to Mariani’s low-ball offer of $500 to do the deed. The two men haggled for a while and finally agreed that it would cost $1500 to end Grace’s life. The widower-to-be had an elaborate plan all worked out and he explained it to Serrano in minute detail–he even supplied one of his old neckties to be used as a garrote. Mariani said that he would hide a large sum of money in the home on Concha Street where Grace was to be permanently dispatched. The hitman would ransack the house following the murder so that it would appear that the crime had been a robbery gone wrong. Mariani thought he was smart when he asked Serrano to provide him with proof that he’d earned his fee. Mariani said he’d be satisfied that “the job had been done” only when Serrano brought him the expensive ring that Grace always wore. Once Serrano and Mariani had sealed the deal the Sheriff’s deputies had no choice but to take Grace into their confidence. She was disbelieving at first, after all she and Francisco were still newlyweds–why would her new husband want her dead? Despite her misgivings, she turned the ring over to Serrano. Mariani was playing cards at a Gardena gambling house when Serrano strolled up to him, handed over Grace’s ring and said, “It’s all done”. The suspect took the ring and then handed Serrano five $100 bills in partial payment for services rendered. He’d promised to may the rest of the money when the insurance company paid off on claims for three platinum and diamond rings that the “killer” was supposed to take. The next time the rotund little man looked up from his cards he was he was surrounded by a group of deputies who summarily cuffed and arrested him. It was hours before he realized that he had been betrayed and that the hitman was actually Sgt. Serrano of the the LA County Sheriff’s Department. Mariani had another surprise coming. 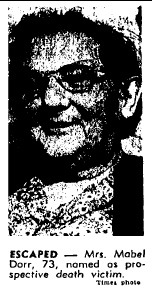 In addition to plotting the murder of his wife he was suspected in the death, just a few months earlier, of his sister-in-law, Miss Emeline Gertrude Sullivan, 73. Emeline’s death was thought to have been caused by complications from several heart attacks she had suffered in the couple of days before her demise. Mariani had bragged to Rodriguez that he’d laced the woman’s eggnog with strychnine and that she’d died within an hour. He was proud of his “perfect crime”. Grace was so horrified by the plot to kill her that she immediately began divorce proceedings. The ink was barely dry on her four month old marriage license when she appeared in Pasadena Superior Court to request a divorce. Grace was pursuing the divorce from her husband, but she still had to deal with the allegations against him for the poisoning of her sister. She agreed to have her sister’s remains exhumed for testing. As the exhumation went forward more damning evidence about the murder plot was being revealed. Sgt. Serrano had worn a wire and had recorded Mariani haggling with him over the price to be paid for his wife’s murder. The D.A. didn’t buy his denials and a formal complaint charging Francisco Mariani with solicitation to commit murder was filed by Deputy District Attorney John Loucks in Pasadena. Bail was set at $50,000. It seemed like everything was wrapped up–Mariani would face trial and Grace would win her divorce. But then the unexpected happened. Grace withdrew her request for a divorce. She had decided to stand by her man! Would the fact that he had Grace’s support make any difference in the outcome of the solicitation case? 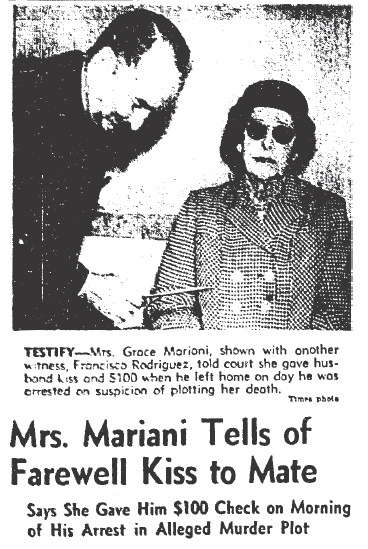 Had Francisco Mariani poisoned his sister-in-law and why did he want Grace dead? 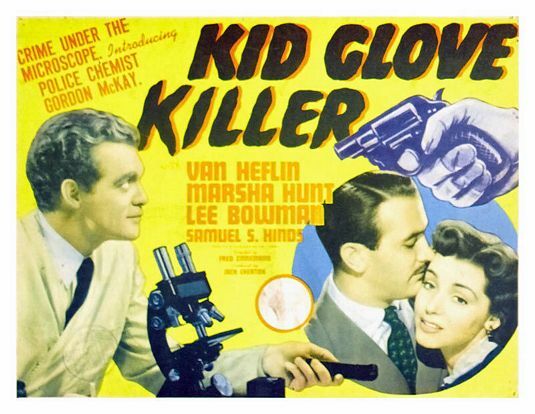 Tonight’s feature is the KID GLOVE KILLER starring Van Heflin, Marsha Hunt, Lee Bowman and Samuel S. Hinds. 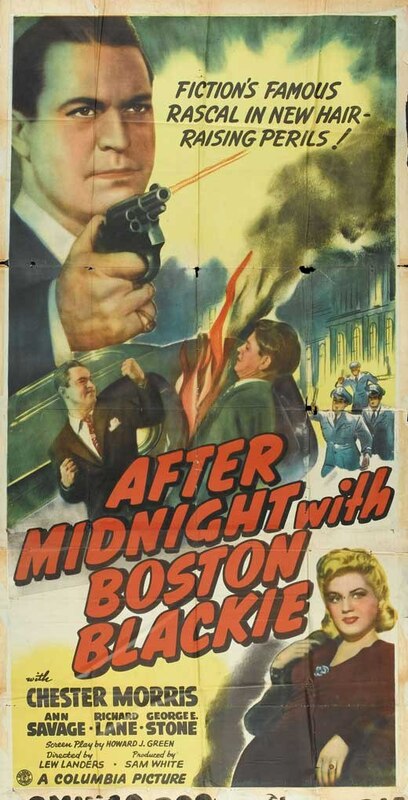 With the help of Gerald I. Ladimer, a slick young attorney, Mayor Daniels and Turnley, the district attorney are elected on a reform ticket to smash the rackets that have been dominating their city. Unknown to the new mayor and district attorney, Jerry is in league with underworld boss Matty, who has promised to back him for the United States Senate in return for political favors. When Jerry realizes that the district attorney is serious about instituting reform, he notifies Matty and soon after, the district attorney is found murdered.